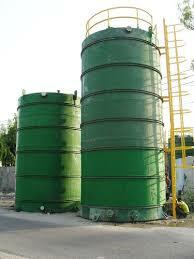 The company is one of the leading Manufacturers and Suppliers of FRP Storage Tank in Mumbai (India). The FRP Storage Tanks are used for the storage of the various chemicals and other aqueous and waste materials. The FRP Storage Tanks are available with various accessories and are suitable for the storage of acids. Manufactured in both vertical and horizontal patterns, the FRP Storage Tanks are easy to install above as well as below the ground level.